In order to avoid hassle and arguments, for ex. with banks, property developers, and craftsmen, detailed contracts and timely controls are important and absolutely necessary. The property developer develops the property at his own expense and sells it; the general contractor sells the ready to use property, without performing any construction work, employing a subcontractor instead; the general contractor offers a ready to use property and performs a portion of the construction work. Fine differences with significant consequences! In such cases, the building owner has an obligation to take utmost care with regards to soil and ground assessments, as a ready-made home has nothing to do with the surrounding property itself. Moreover, a different set of rules govern the closing of a contract than with usual purchases. 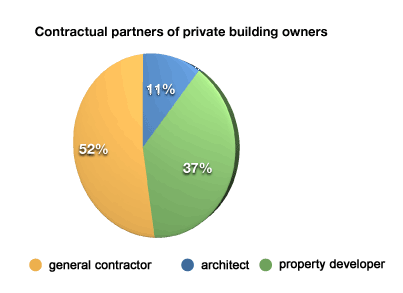 In such cases the building owner does not negotiate a buying contract, but a service contract. Whether with regards to supporting consultations or to technical contributions- our actions take the weight off your shoulders considerably and, in doing so, allow you to avoid stress, resulting defect damage, and the financial risks involved in exceeding estimates. Multiple step supervision and controlling procedures throughout the entire construction process.